The rulebook for Weird of Hali: The Roleplaying Game is coming along nicely at this point, and one of the remaining tasks is making sure it's well stocked with monsters. Now of course this is Weird of Hali, so the player characters are on the side of the monsters, dodging heavily armed Radiance negation teams and subtler dangers alike, but there still has to be a good collection of eldritch creatures. I've already included everything that appears in the seven novels of The Weird of Hali -- Deep Ones, voormis, shoggoths, the basement-dwelling and obligingly hungry formless spawn of Tsathoggua, and the hideous and not always visible Shambler from the Stars, among many others -- but a Lovecraftian adventure is like a wildlife park: the more critters, the merrier. 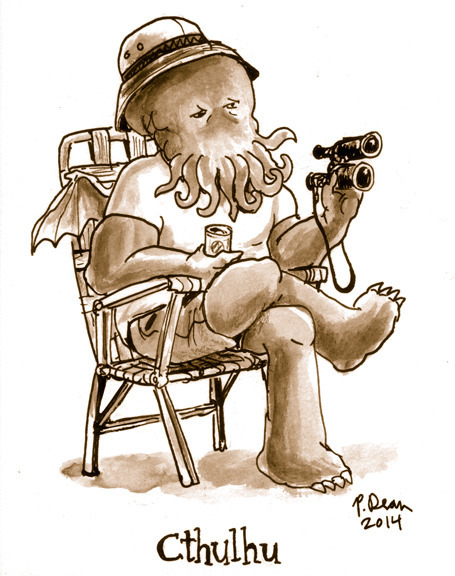 So the question I'd like to toss to the tentacle fans among my readers is this: what hideous creatures out of old-fashioned weird fiction would you like to see in WoH: The RPG? a) if it's from movies, TV, anime, etc., I'm not really interested. The raw material for this project is pulp magazine fiction, above all the legacy of the between-the-wars golden age of the weird tale. I may at some point make an exception for kaiju -- that is, Japanese movie monsters of the Godzilla genre -- but that's really a separate project. How about the Hounds of Tindalos? Ubbo-Sathla? He doesn’t do much but lie there, but he could provide atmosphere. Two good candidates. Thank you! No, but potentially a workable option, so thank you. In The Weird of Hali the Color out of Space is one of the two kinds of matter furthest from the kind we have here on Earth -- it's the Nhhngr mentioned in Wilbur Whateley's notes, to be precise -- and when it's not balanced by the other kid, the Yr, it tends to make other kinds of matter turn into more Nhhngr; unfortunately Nhhngr won't support life as we know it, which is why people affected by it turn gray and crazy and crumbling, and then die. Having some of it in a context where it could accidentally or deliberately be let loose would be a good thing to put into a high-intensity game. You might also consider Ithaqua the Windwalker and Yig, the Father of Serpents. Thank you! In they go. Ithaqua was already on the list -- he'll be a major presence in A Wind from Hyperborea, of course -- but Yig is very much worth having as well. The first two would be the undead witch Abagail Prinn and the unholy one she tries to summon, Nyogtha in The Salem Horror by Henry Kuttner. Thank you! Nyogtha's a major presence in my as-yet-unpublished novel The Shoggoth Concerto and it's as-yet-unfinished sequel The Nyogtha Variations, so he's already in -- in my retcon of the Mythos, Nyogtha was created by the Elder Things, rebelled against them, and sided with the shoggoths, which is why the Elder Things are extinct. (Do not mess with The Thing That Should Not Be!) I hadn't thought of including Prinn, though, and that's a good one -- I may even include her in an adventure. Azedarac -- hmm. Not sure if he's suited to inclusion in the rulebook, but we'll see. Certainly a relic of St. Azedarac with strange powers would be an absolutely perfect Macguffin, and his potions would also be useful! Oh, and also gotta have a way to summon The Hounds of Tindalos! Man I can't wait to play this. I play mythos games on the regular with a few friends. And yes, poor Abby Prinn's sad yet courageous story is begging to be freed from Radiance propaganda! I hope you enjoy it! You're right about Ms. Prinn, of course -- I may bring her into an Owen & Jenny short story. The sharp angles on Stealth aircraft summon Hounds of Tindalos so they will eat radar waves- that's how Stealth works. Maybe Lovecraft read something about radio waves and right angles. The Javanese flying cucumber was the basis for Otto Lilienthal's hang gliders and might be a gliding form for a Shoggoth. Hah! I like that. As for gliding forms for shoggoths, the shoggoths I've encountered in my stories and imagination are rather agoraphobic -- they get very uncomfortable when out under, as they put it, "the empty sky." Still, there's a whole ecosystem at high altitudes -- cf. "The Shambler from the Stars" and that forgotten but very fine Arthur Conan Doyle story "The Horror of the Heights" -- and those huge, gelatinous, semi-solid creatures deserve a place. Funny enough, my favorite HPL story is probably his only actual sci-fi story, "In the Walls of Eryx". The Venusians in that story are given scant description, but that just means you can create your own descriptions, abilities, social systems and hierarchy, etc. HPL's depiction of Venus could be some sort of adventure setting, (assuming there's a way for the PC's to breathe), including invisible mazes and power crystals. I haven't actually read your Hali books yet, but earlier tonight I ordered the first one in paperback. Please note that, as far as I can tell, there is some sort of HTML code error on the Founders' House web page to buy Kingsport in paperback. The PayPal "Add to Cart" button doesn't seem to do anything. I've tried it in two different browsers, Chrome and Firefox. I sent a message to Founders House, I guess I'll order Kingsport later when they fix it, as I'd rather give my money to them than Amazon. That probably belongs in a supplement rather than the basic rulebook, but it's a good idea nonetheless, so thank you. I could see pairing Lovecraft's Venus with Clark Ashton Smith's Mars, adding in some other sources for other planets, and having quite the supplement -- the title, of course, would have to be "Eldritch Worlds." Fun! I've forwarded your comment about the website to Founders House -- with any luck it's a temporary glitch and will be fixed shortly. Since Hyborian creatures are allowed, how about Yag-kosha's species from "The Tower of the Elephant"? Perhaps one of the earliest sympathetic treatments of an eldritch being in weird fiction. Thank you! I haven't read that story for too long; I'll check it out and definitely consider Yag-Kosha's kin. I have always liked the carnivorous apes and serpent-folk of the Conan Stories. I would be into encountering them (in a game). They are nice lower level threats for low level characters, also, which can be hard to come by in cthululand. Serpent folk are already in -- I fused Howard's serpent folk with Clark Ashton Smith's, and they're a lot of fun. (Well, if you don't mind a species that considers poisoning to be one of the fine arts...) Carnivorous apes, though, that's one I hadn't thought of, so thank you. One thing I like about the Mythras rule system that I'm using as the basis for this game is that characters don't become omnipotent, the way they do in late-version D&D. A very experienced character with lots of skills at high levels can still be done in by a knife thrust if he's unlucky or careless. A carnivorous ape? If you don't have lots of firepower on hand, one of those is a real threat no matter how experienced your character gets. Keziah and her giggly pet, Brown Jenkin? Wouldn't miss 'em for the world. Beings of Brown Jenkin's species put in an appearance in the fourth volume of The Weird of Hali, and Keziah and her familiar appear in person in the seventh. Thank you! I suggest Yag-kosha "trans-cosmic being" with the body of a man and the oversized head of an elephant. The blind and tortured prisoner from "The Tower of the Elephant" is probably the most memorable critter from Robert E. Howard's Conan world. At least I can remember him vividly after more than decade and half since I read the story! Okay, that's two votes for Yag-Kosha. I'll definitely check him out. How about the incorporeal being that haunts the meadow in Clark Ashton Smith's short story Genius Loci? It's one of my enduring favorites. Ooooh. That could be seriously fun. Thank you. I imagine you have some Zoogs in there? Those being the sentient rodents from the Dream Quest? If you have Zoogs though, you'll also want to have cats too. I'm still trying to figure out how to work in the critters of the Dreamlands, and the Dreamlands themselves; that may want to go into a supplement. Still, good point -- zoogs and gugs and ghasts, oh my! Machen's (by way of Blavatsky) sinister—or in this case, misunderstood—Turanians could be a fun addition! Thank you for the reminder! Yes, and I can retcon them together with Howard's Worms of the Earth to add to the fun. Came here to say Brown Jenkin, but I see someone beat me to it. Also, has anyone mentioned Mi-go? Yes, and Brown Jenkin's definitely going to be there -- in fact, his whole species will be. The main point of this comment is not in reference to a monster or creature, but to a skill that might be something the characters can develop. It may already be in your game book, but if not consider astral travel/dreaming/pathworking / remote viewing as a set of inter-related though distinct skills the characters can develop for possible the various possible uses each of those might have in the world of the Weird of Hali and its various recensions. A skill in dreaming might relate to premonition, whereas pathworking could relate to being able to commune, in their own sphere, with various spiritual entities. Remote viewing would be more for scoping things in the physical out... etc. One creature that comes to mind from this would be an "astral barnacle" don't know what the technical name for it is, but the little things common in the lower astral that might cling to someones etheric body. Just had these thoughts after my last comment. The challenge will be working out ways to use those in an RPG effectively. That's not a "no" by any means -- I've been considering something like this, as well as divination -- but it's going to have to be thought through carefully, and then playtested to destruction. I happened to see this massively ironic article about the "Carousel of Progress" ride at Disney. PS Got Chorazin in the mail the other day - I'll probably get to it this weekend! The Shan or Insects from Shaggai. Anybody Delta Green hates that much must be OK.
Ice Age Megafauna, cryptids, and ordinary animals and / or rules to create them. My war mammoth stomps on the grey SUV. I'll have to check on the copyright status of the Shan to see if they're an option, but since Delta Green is a Radiance front organization, why, yes, that's a good point. I've always been a fan of Marc Laidlaw's "Leng", published in 2009, where the real-life parasitic Cordyceps mushroom is, far up in the Himalyan plateaus, parasitizing and controlling a human culture as well. Might be treated more like a disease than as an entity you can really interact with, but maybe that will get your imagination started - I would think there are quite a few horrible wasting diseases or bodily conditions you might want to include in your sourcebook. Well, but remember that in The Weird of Hali the eldritch tentacled awfulnesses turn out to be the good guys. The bad guys are technocratic rationalists who want to put the whole cosmos under humanity's (i.e., their) bootheels. This isn't your common or garden variety Lovecraftian game -- and it's fantasy, not horror. Dean's Lurker at the Threshold seems especially good. I find his stuff hilarious. Some of the alien creatures from Weinbaum's A Martian Odyssey wouldn't seem out of place. Especially the predatory "dream-beast" that uses mind reading and telepathic illusions to lure prey into its (of course) tentacles. It occurs to me that during the same time period eldritch creatures were getting such a bad rap in the weird tales, Earth's native creatures weren't faring much better in the pulp adventures. Species ranging from gorillas to rats to ants to giant clams were constantly and invariably portrayed as bent on gratuitous homicide. There might not be any straightforward way to either follow or subvert that tradition in the WoH game, but stats on a range of terrestrial creatures, that can be summoned into play as allies or altered by Radiance science and fielded against the player characters, might be useful. Duly noted! Weinbaum's critters can certainly be considered for the Eldritch Worlds supplement. Just casting my mind back to "The Curious Case of Charles Dexter Ward," you've got the unmentionable horrors in Curwen's pits (what if a Radiance goof-up released a pack out into the streets? ), Curwen himself got up to some vampirism (I can't see how he's the only sorcerer to learn that trick), and it seems like you could work up some serious shenanigans with the resurrecting salts. Also, in my jaded old age, I'm thinking the Radiance would be in league with the Arisians. I seem to recall that Earth in the Lensman universe becomes a technophilic hellscape bombarded with unceasing advertisements (not to mention the Lensman graduation ceremony has striking overtones of totalitarian precision).